Green Vape proposes the Cust'art E Liquid, a collection full of gourmandise, therefore recipes which are inspired by the famous Custard Cream. Make your choice amongst 5 liquids if great quality: Raspberry Breed, Monkey Mix, Mild Pot, Bloody Cream or even the Loving Apple. Each will finf there happiness. 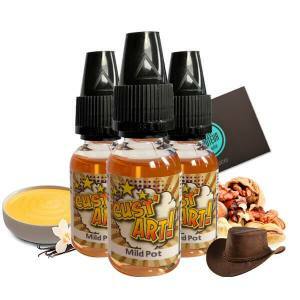 With the Cust'art Green Vape e liquids have cooked a gourmet and rich collection, with recipes which have a base of Custard Cream. You will appreciate the Raspberry Breed, with a mixture of Vanilla and Raspberry Compote, Cust'art Monkey Mix associated with Banana and Custard, the Mild Pot with a classic blond, custard and shelled fruits, the Bloody Cream, a custard associated with Red Fruits freshly handpicked or even the Loving Apple, an apple which marries perfectly with caramel and vanilla.